Whilst there are no laws giving guidance on what you can or can’t wear whilst riding your bicycle, the Highway Code gives some helpful guidance on how to improve your personal safety whilst out on the roads. 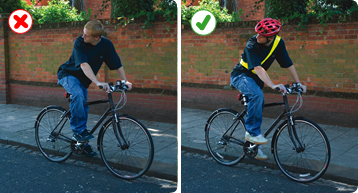 a cycle helmet which conforms to current regulations, is the correct size and securely fastened. appropriate clothes for cycling. Avoid clothes which may get tangled in the chain, or in a wheel or may obscure your lights. light-coloured or fluorescent clothing which helps other road users to see you in daylight and poor light.